Temple of Verai Mata, Gota, Ahmedabad. Hindus have always decorated their temples and shrines with narrative illustrations that depict stories of the gods and goddesses. Mata ni Pachedi literally means “behind the mother goddess”, and is a cloth that constitutes a temple of the goddess. When people of the nomadic Vaghari community of Gujarat were barred from entering temples, they made their own shrines with depictions of the Mother Goddess on cloth. This ingenious solution is believed to be the origin of Mata ni Pachedi, the sacred art, which is now revered by many. Apart from its use for worship, these paintings are now also considered art and often purchased to be hung as wall paintings. Artisans make these paintings using the same methods that have been followed for over three hundred years. Cotton fabric is first de-starched and then treated with Harada paste, to prepare it for absorbing the colour. Outlines of the figures are painted first, with black colour prepared from jaggery and iron. After this, red colour extracted from tamarind seeds is filled in and the areas supposed to be white are left blank. After application of each colour, the fabric is boiled in alizarin solution to bring out the colour, and then washed. 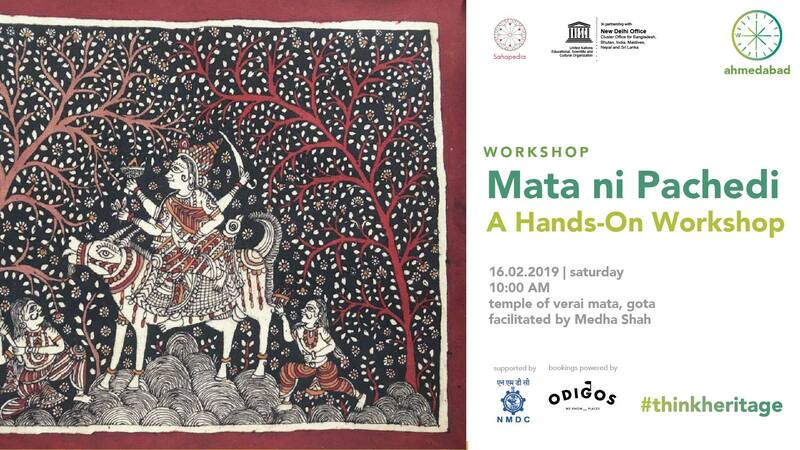 The workshop will begin with a brief history of Mata ni Pachedi. Participants will get a hands-on experience of making Pachedi followed by a Q&A session. Parking facilities are available close to the meeting point.